CCC understands the importance of being in compliance as it is a way to maintain not only our state’s seafood sustainability, but also to maintain the financial sustainability of fishing families. CCC staff can help both new clients obtain specific licenses, as well as existing fisherman renew their licenses. 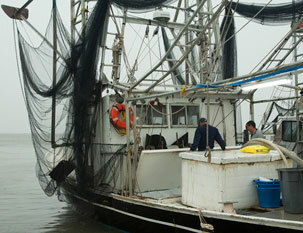 CCC acts as an intermediary between the Louisiana Department of Wildlife and Fisheries (LDWF) and the commercial fisheries community to ensure that any persons involved in the fishing industry, whether recreationally or commercially( including wholesale/retail dealer),s are licensed in the state of Louisiana. Because CCC has a strong partnership with the LDWF, clients are always kept informed about any industry mandated changes and/or updates; our skilled staff can translate these updates into Cambodian, Spanish and Vietnamese. CCC also maintains a partnership with the National Oceanic Atmospheric Administration (NOAA), assisting both clients and NOAA with data collection, particularly regarding vessel and gear surveys and shrimp landings reports. Clients' data is organized by CCC and sent to appropriate state and federal agencies for use in their databases.